As Aston Martin surges on into the controversial with the styling of its new DB11, Zagato has everybody else covered with a recent string of beautiful Vanquish redesigns in coupe and convertible form. And now it would seem there’s even a roadster variant. 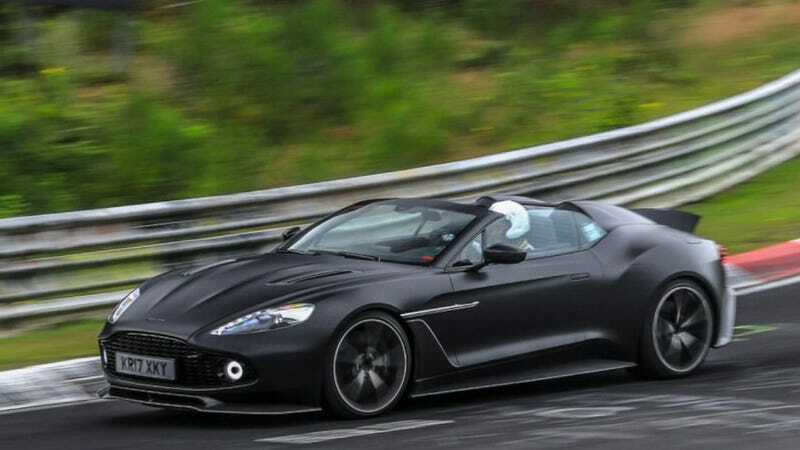 Spotted on the Nürburgring in this video from BridgeToGantry, a previously-rumored roadster version of the Zagato Vanquish has been spotted howling around in a lovely black and bronze guise. If it’s anything like the two other variants, that’s a 582 horsepower carbon fiber masterpiece (in my opinion) running around. Since we’ve had no official word yet on a Zagato Vanquish Roadster of any sort, one might also speculate that this could just be a very, very expensive one-off ordered by somebody who wanted to feel even more special about their special Aston Martin. Can’t say I’m a fan of the bronze accents coupled with the seemingly maroon soft top, but I’m poor and my taste is questionable.